Our family loves eating veggie burgers. The problem is that we're picky about them. The ones that we can usually find at the store feel - and taste - like rubber with a little bit of flavoring. We found one brand which we liked the taste of, but the patties would fall apart with the greatest of ease making them a little difficult to consume. Lately we've settled on a black bean burger that we've found at Costco and those are pretty yummy. 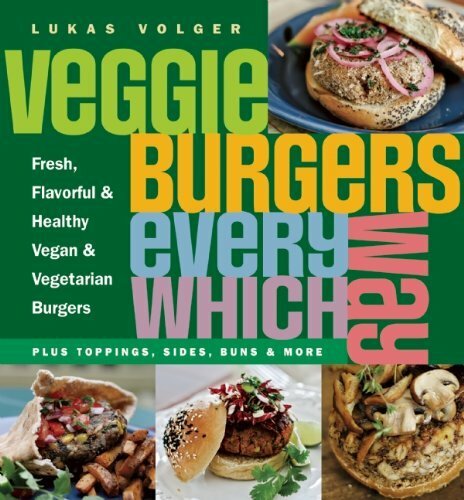 I've been wondering just how difficult it would be to make our own veggie burgers and so I was both excited and delighted to find Veggie Burgers Every Which Way , by Lukas Volger. I appreciated the fact straight away that Volger says that it can take some time to learn how to make your own veggie burgers well. It can be tricky determining the perfect amount of bread crumbs necessary to help hold your burgers together. Also, you want to cook them well so that they are neither too dry or too wet. It doesn't sound like something that is incredibly easy to perfect on your first try! However, Volger offers plenty of tips to help you master the art of making veggie burgers with a little bit of practice. As I've mentioned elsewhere, our family is neither vegetarian or vegan but we do tend to eat more beans than we do meat as a general rule. My husband was raised vegan and I was raised Texan so we've had to find our own happy balance. For the most part, we eat lighter meat (like chicken) and avoid pork almost entirely. (I do love bacon though. As does Jonathan, I should point out!) We consume a great deal of beans and veggies. One of the main objections I had to the vegan lifestyle, as I encountered it, upon moving to Oregon was that no effort was given to taste. I didn't want to eat vegetables because they were served raw (frequently) and bland (with limited-to-minimal spices). I can't make myself want to eat healthy if it tastes gross. But, both Jonathan and I experimented and tried new things until we settled on tastes that suited us both. It all evens out! I have learned that eating lots of vegetables and beans can actually be an enjoyable experience - not to mention quite delicious. Veggie Burgers Every Which Way just gave me a boatload of new ideas and tastes to bring to our family's dinner table. Along with these main burger dishes, Volger also provides recipes for sides, such as: watermelon and citrus salad, roasted corn salad, black olive and roasted potato salad with arugula and cumin-spiked roasted sweet potato fries. There are also recipes for sauces and buns. Yum! There are lovely pictures spread throughout this book which only fuels my enthusiasm for it. I'm going to go wild with this book. I'm now bound and determined to conquer the veggie burger and leave all rubber substitues behind us forever! Many thanks to The Experiment for providing a copy of this above title to me in exchange for my honest thoughts. I am also excited to say that The Experiment has offered to giveaway one copy of this title to one of you! Would you care to win? Simply leave a comment below. This contest is open to US Residents only and will remain open through Monday, April 8th. If you are curious to know more about The Experiment (a cool name for a publishing company!) you can find them on Facebook and Twitter (@experimentbooks). THIS CONTEST IS NOW CLOSED. THE WINNER, as selected by Random.org is #4 - Heather! Congrats! I like black bean burgers--a local restaurant serves a really yummy one. I'd like to havea copy of this book! We have a vegan and several vegetarians in our home--this looks like a good book to try especially as the weather warms up and we enter bbq/picnic season. Thanks! I'd love to try some recipes for my veggie friends! I have been looking for new ways to eat less meat. Just added this to my wish list. I'm always trying to find healthy meals and meat less meals to add some variety to dinner time. I haven't ever tried to make them before. The store bought frozen ones, well, often taste like the cardboard box they come in. I would love to have this cookbook. Ours still usually ends up falling apart. I'm the worst at "eye-ing" how much to put in if I pretty much know a recipe. Unfortunately, that doesn't make for consistent outcomes. I'd love to try some of these recipes! We could use a little mixing up around here. This is very interesting. I haven't eaten red meat for 16 years, and my preferred "burger" is the spicy black bean kind from Morning* Farms. I tried making a white bean burger last summer and was unimpressed. I'd like to try a different recipe soon.